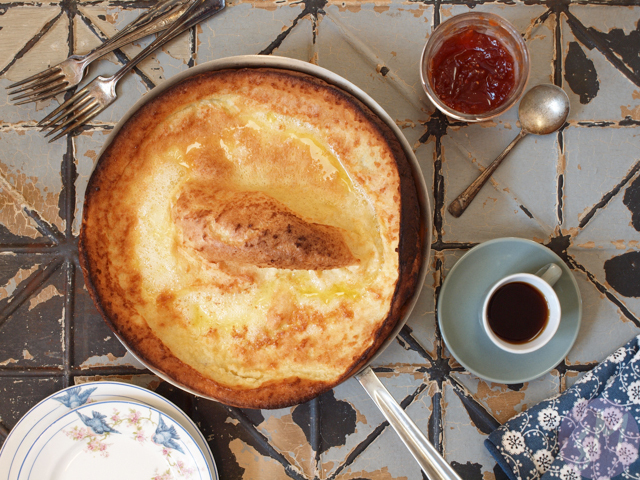 A Dutch baby is basically a combination of a pancake and a popover. I decided to make it one morning because I wanted pancakes but I was too lazy to make them. With the Dutch baby you use pancake-like batter and stick it in the oven with a bunch of butter and let everything do its magic. It is important to melt the butter in the pan in the oven as it will also preheat the pan. I used an All-Clad pan as they are oven proof. I tried to use a thick ceramic pie pan previously but the middle didn't cook through fully. Once done, you can slice it up into pie-like slices and serve with jam, powdered sugar, syrup or anything you like on pancakes. 2. In a large bowl, combine flour, sugar and spices. In a separate bowl whisk eggs until well-blended, add milk and stir until combined. Carefully pour the liquid ingredients into the dry ingredients and whisk rapidly until smooth and there are no lumps. 3. Melt butter in the oven-proof pan in the oven (this step accomplishes two things: it preheats the pan and melts the butter). Once the butter is melted and before it starts to sizzle, pour the batter into the pan, give it one whirl with a whisk and put the pan back in the oven. Bake at 425 degrees for 20 minutes. Then lower the heat to 325 and cook 3-5 minutes more, until the sides rise and turn golden brown and the middle is golden. 4. Remove from oven and if desired, sprinkle with confectioner's sugar. Serve and enjoy.